The story of the original Duke and Duchess of Windsor, the former King Edward VIII, is one of utmost love and devotion. It is a story filled with tragedy and yet, with a strong desire never to give up what is most important in life; love. For King Edward VIII, the love and dedication that he had for his country and everything that it desired of him was important, but there was nothing more important than the love he had for Wallis. For her, he was willing to do whatever it took, and she was willing to do anything she could for him as well. But could either of them truly be happy if the king chose to remain as such? Or if she chose to remain in her marriage? The King and Mrs. Simpson by Erin Schulz is where you’ll see the true meaning of love and a willingness to give up all. This is a story that’s going to make you think again about what love really means. Being willing to give up everything for someone else is one thing, but actually giving it up, especially when what you have to give up is worth so much, can be a different thing altogether. For King Edward VIII, he had more to give up than anyone, but he had such a strong love for Wallis that he was willing and actually did give up the throne. This is their story and it is one where each tries to sacrifice for the other. It’s a story of love, sacrifice, devotion and definitely destiny, but also of proving to the world that nothing is stronger than all of these things in The King and Mrs. Simpson by Erin Schulz. It was December 1936 when the United Kingdom and Commonwealth were told their king, Edward VIII, would be sacrificing the throne for love. But what were the events that were responsible for him making such a difficult choice? From a young age, Edward was prepared for the role of monarch. As Edward is crowned, little does he realize that a social gathering in England would end his reign six years later. Follow the events which led to the union and subsequent marriage of American divorcee Wallis Simpson to the king of England. With testimonies from Edward's and Wallis’s biographies, this story will lift the lid on the truth behind the famous headlines. As Edward battles with the royal court, parliament and family members to marry the woman he loves, Wallis becomes the focus of hatred. The entire establishment is in crisis when a king chooses love over duty in The King and Mrs. Simpson by Erin Schulz. This well-researched book takes a refreshing perspective at a much-publicized historical event. I love the flowing style in which the author has written this story; it draws you into the lives of Wallis and Edward almost immediately. I thought I knew a great deal already about this famous time in British history. However, the details documented throughout delve behind the headlines and reveal shocking truths that are little known. The author has covered this subject with sensitivity and added great detail to the events of the time. I believe The King and Mrs. Simpson by Erin Schulz shines a light on the true personality of Wallis, her childhood, background and troubled marriage. I can now understand why Edward fell in love with her and sacrificed everything. It was such a refreshing change to read a positive angle on such a well-known story. The revelations regarding Queen Mary and Churchill's involvement and the little-known events leading to the onset of WW2 took me by surprise. This emotional account of a true love story is highly recommended for anyone who loves to learn about all viewpoints of historical events. If you are looking for a great book that is historically and scandalously true , look no further. The King and Mrs. Simpson: The True Story of the Commoner Who Captured The Heart of A King by Erin Schulz is a captivating historical account about the love affair that shook Britain and startled the world. Although this book is novella length, it seems longer because the in-depth perspective demands our attention, or should I say our enthrallment. In The King and Mrs. Simpson, Erin Schulz examines the politics that surrounded the affections the king felt for Mrs. Simpson. While WWII loomed in the future, Britain focused on the royal family and the horror of the king marrying a commoner. Erin Schultz skillfully intertwines the complexities of the love affair between American and twice divorced Mrs. Simpson and the king of England and answers the question, 'why couldn't the king marry whomever he chose since he was king '. Erin Schulz does a masterful job telling the story about the abdication of the king. Surprising facts surface throughout The King and Mrs. Simpson. For example, as a San Diegan, I was interested to learn that Mrs. Simpson had at one time called San Diego her home. I was also surprised to learn how determined the king was to marry her, no matter how those around him advised him against it or how many times she tried to talk him out of it. It is a story I could not stop reading, and I expect you will experience the same fascination. This book deserves the highest rating of five stars. The King and Mrs. Simpson is a work of biographical non-fiction penned by author Erin Schulz, and narrated in audiobook format by Jill Rolls. This short but poignant account records, in its own words: ‘The True Story of the Commoner Who Captured The Heart of A King’. 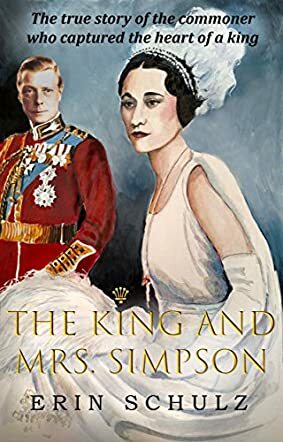 One of the greatest scandals of the early twentieth century, this novella-sized work creatively retells the shocking abdication of British King Edward VIII when he openly decided he would rather marry American divorcee and socialite Wallis Simpson than rule his country. Told from their perspective with a sympathetic and romantic tone, the story recounts the six years in which this couple met and eventually led to shocking the whole world. Part biography and part creative non-fiction, author Erin Schulz really knows how to bring history to life whilst maintaining her authority and strong research skills as a biographer. This book really had me gripped from the start because of its glorious descriptions of palaces and the swanky parties and locations where Wallis and the king lived and socialized. It sounded like a really interesting museum guide, with a well constructed plot and a fully realized sense of character. Overall, The King and Mrs. Simpson is a beautiful retelling of one of the world’s biggest love stories. In terms of audiobook quality, Jill Rolls narrates the tale with a clear and compassionate tone. She sounds very formal and British, which suits the royal tone of the piece, bringing the settings to life with great authority. The audio quality and editing were also excellent. Wallis Simpson was an American socialite who grew up in Baltimore and for much of her early life she relied on others for support. Her father died following her birth and she and her mother relied on the kindness of their wealthier family members. Her first marriage to a naval officer named Earl Spencer was at the age of 20 and was not a happy union. Her husband was a heavy drinker and Wallis was unable to cope with his violent outbursts and abusive behavior. The marriage ended in divorce, much to the consternation of her family, and she was left to fend for herself. Her second marriage to Ernest Simpson was much more a suitable match and although Wallis was lonely in London she soon began socializing with a vengeance. The King and Mrs. Simpson by Erin Schulz is the story of the abdication that shook the British nation to its core in 1936. It is different from other accounts in that it tells the story of the people involved from their point of view. When Mrs. Simpson met the future king of England, he was a charismatic character that loved women and enjoyed a robust social life. Nobody could have foreseen the events that would follow or the devastating effects that love could cause. In modern days as we observe the acceptance of an American divorced actress into the Royal family, it can seem strange to comprehend what happened when the king wanted to marry for love. Mrs. Simpson has been portrayed as a heartless gold-digger that yearned to become queen. The truth is quite different. She had no wish to reign in England or adopt a Royal title. The King and Mrs. Simpson by Erin Schulz tells the tale of a couple who just wanted to be together. It also tells us that Mrs. Simpson was also willing to walk away to save her lover's position, but it was the king who was determined to stick to his guns. History has not been kind to the couple, but this book helps us understand the human aspect. A love story is compelling, and this is surely one of the best love stories ever.